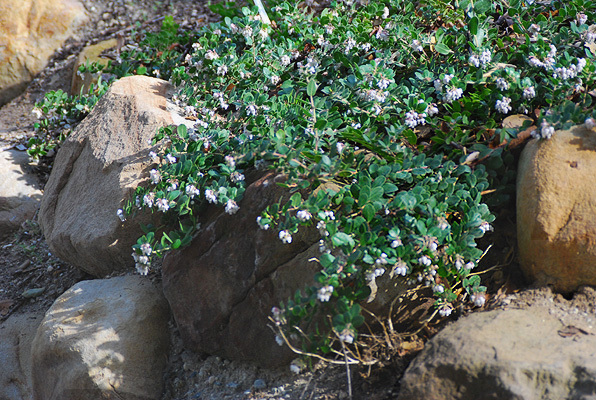 Broadleaf evergreen shrub or ground cover, mat- or mound-like habit, to 4 ft (1.2) m high in its habitat, usually much less [i.e., 12 inches (30 cm)] in cultivation, forming a mat 6 ft (1.8 m) wide or more. Stems finely tomentose, may root when in contact with the soil. 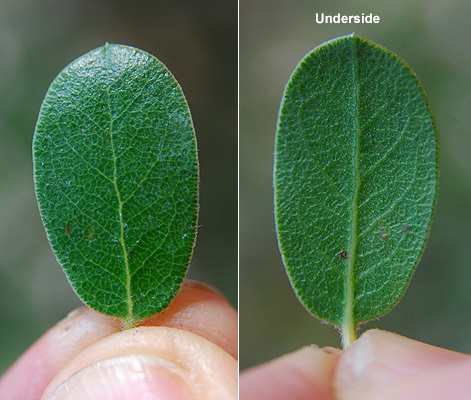 Leaves alternate, simple, round to round-ovate, 12.5 cm long and about 1 cm wide, base truncate to somewhat lobed, margin entire, blade often cupped with the upper surface being convex, dark green, sometimes shiny; petiole 2-3 mm long. New growth often reddish or bronze. Flowers small, pink, in small clusters. Fruit 6-8 mm wide, flattened sphere, without hairs, reddish brown. Sun or part shade. Drought and some forms heat tolerant. ‘Carmel Sur’ ---- robust grower, gray-green leaves, pink flowers. ‘Bert Johnson’ ---- forms a flat mat, gray-green leaves, bronze new growth, white flowers with pink tinge. ‘Danville’ ---- light green leaves on reddish stems, pink flowers. 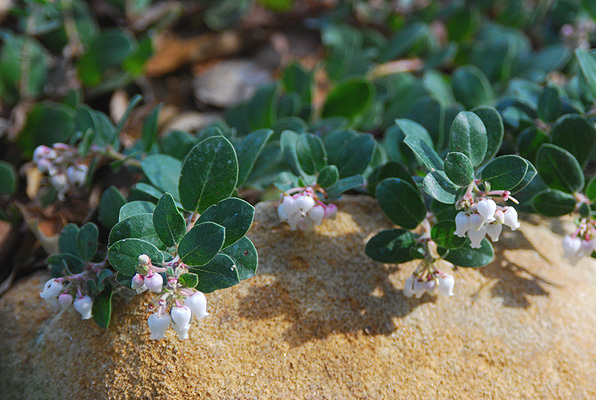 ‘Little Sur’ ---- slow growing, forms a dense mat, pointed leaves with reddish margins, pink flowers. var. parvifolia (‘Parvifolia’) ---- slow growing, forms a dense mat, glossy leaves, new growth bronzy, pink flowers, reportedly best in a coastal environment.